We took a number of elevator detours on our return home from a Nebraska trip, where we delivered our daughter to her summer veterinary camp. During the four-day program presented by Oxbow Animal Health, she learned the inner workings of a cow, and lovingly operated on and sutured a stuffed bunny. Apparently there is no such experience offered to children in Illinois. The trip home was a meandering route with a number of switchbacks, with elevators built by Tillotson Construction, of Omaha, spaced every few miles. 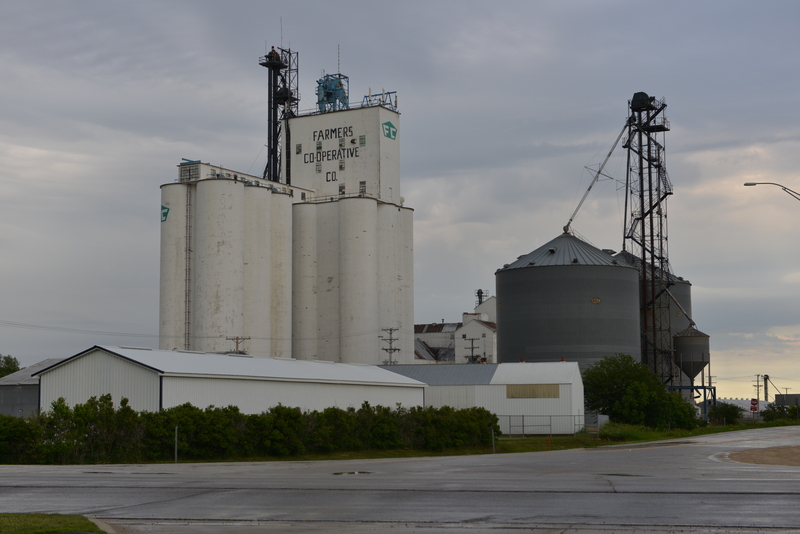 One elevator stop on our sojourn was Dike, Iowa, in the central part of the state. This fascinating site was the last one we saw before the light failed. We were racing a line of weather, and as the sun sank the clouds built and made for very flat light. It is enlightening to see an elevator complex in person and compare it with an early photograph. The changes wrought in almost seventy years can be surprising, but even more unexpected can be the features that remain the same. At Dike, you immediately notice a wooden structure behind the main structure. Strangely, it does not appear to be the same elevator that appears in the old photograph. Why would the co-op replace a wooden elevator with another one? The obvious answer would be a fire, but if wood was obsolete, why continue to build with that material? In my travels, I have rarely come across a wooden elevator that was built before the 1940s and still in use today. Technology rendered the old ones obsolete, and wear and tear made them difficult to operate. Fire also took many of them. Now, wooden elevators built as late as the 1970s are coming down as more valuable uses are found for their wood, and as regulations make them harder to license. The main house of the elevator at Dike, Iowa, built in 1946 (Tillotson Construction’s annex, left, 1949), is crowned by a rectilinear headhouse. Dike’s concrete elevator was built in 1946, and it came with an unusual (for Tillotson) headhouse. In the one place where we found a similar example, at St. Francis, Kan., the elevator built by J. H. Tillotson, Contractor, sported a rectilinear headhouse. Though it was replaced much later, early pictures show that the St. Francis headhouse was built in that style. Both the old Omaha company and its later offshoots preferred curved architecture because it was more economical to build. So the Dike elevator was a non-typical construction, and we know from its early photo that it started out that way. Since we have no record of it in our Tillotson company records, we have to assume it was built by another company. But the Omaha company led by Reginald Tillotson built the annex. Tillotson Construction arrived on scene in 1949 to add the annex just three years after the main house was built. In the late 1940s, when elevators were filled just as fast as they could be built, annexes sprung up almost before the concrete cured on the original elevators. Main slab steel (size and spacing): 1″ diameter, 5 1/2″ o. c.
Tank steel and bottom–round tanks (size and spacing): 5/8″ diameter, 9″ o. c.
Top conveyor: 30″ belt at 500 bushels per minute; 7,800 bushels per hour; 10 horsepower drive; Howell tripper. This entry was posted in J.H. Tillotson, Contractor, Photography, Reginald Oscar Tillotson, Tillotson Construction Company and tagged architecture, construction, Dike Iowa, elevator annex, grain elevator, Reginald O. Tillotson, slip-formed concrete, Tillotson Construction. The elevator was built by Tillotson also. I know this because I designed and my company installed all of the machinery upgrades in the elevator and annex in the late 70’s. The blue leg that sticks up through the head house is part of that project. The coop manager at that time was Daryl Nagle. He had blueprints of the elevator and annex, both clearly indicated Tillotson as the contractor. I used those prints to design the upgrades. Thank you for verifying the builder. We didn’t have any mention of Dike’s main elevator in the company papers, but we know some of those pages are missing. The co-op was closed the day we drove through. The main elevator had no external manhole covers that I could see, either. Can you fill us in on any more of the details of the work you performed there? What function did the wooden structure beside the elevator perform, or is it newer? External legs seem to have helped prevent fires. Was that part of the reason for the upgrades? Thanks for contributing your knowledge and experience to the blog! The wood structure you refer to is an animal feed manufacturing facility (feed mill). 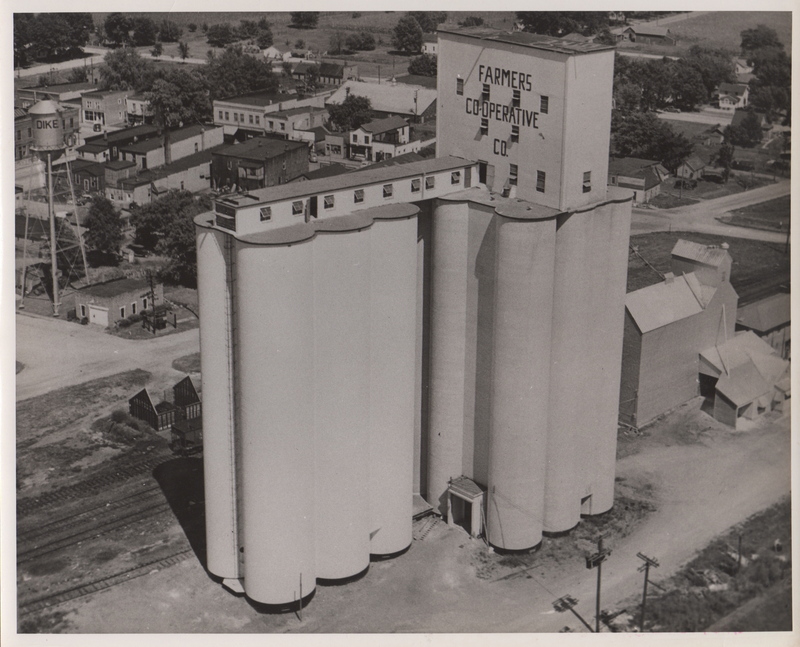 There were several contractors that built wood feed mills in Iowa in the 60’s and into the early 70’s. The work we performed included removal of the old bucket elevator, the pothole type distributor, the old rail load out scale and the fill and reclaim belt conveyors for the annex. We installed new higher capacity leg, fill and reclaim drag conveyors, a “rotoflow” distributor and new spouts plus a rail load out spout on the elevator and a second load out system in the annex. The system in the annex was very sophisticated. The original design of the structure would not withstand the loads imposed by a high speed load out system with side draw gates so we installed “let down tubes” in the 3 rail side silos so the silos could be unloaded rapidly but would draw from the top. Dike lost rail service sometime after this was installed but while they had service the elevator was an efficient unit train loader. I would love to visit an elevator with someone like you to learn more of the terminology, and to see an elevator in action. It is fascinating to learn how it all works. My background is engineering, but it was a long time ago. You achieved a great thing when you designed the system that extended the life of the Dike elevator by decades. It’s quite a profession. It is too bad so many places lost rail. I wonder if it will ever make a comeback. Rail is a pretty fuel efficient way to move things, and I wonder if railroads are regretting that they dropped some of their lines. Thanks for sharing with our readers. You add a lot of good information to the blog, and we sure enjoy hearing from you. You are most welcome. I spent the first 28 years of my construction career building, designing and managing the construction of slip formed structures, mostly grain elevators and feed mills from 1970 to 1998. I have over 200 “slips” where I was on the deck during construction in my resume. My Father who brought me into the business taught me to respect the work of our predecessors like Tillotson, Sampson, Jones Hettelsader and many others. I knew several of the Russell brothers, Bob most of all. My grandfather was out of the business by 1955. But he came from the Tillotson group originally. It’s neat to see how the companies developed over the years, and the continued improvement in technology. You had a career to be proud of–and your work will continue to survive for years. That’s what I love about all this. An early Cargill country elevator complex at Ashton, S.D.